Well, today was a rather special day for Tech Coach HQ as I received a new Surface Pro 4 to review from Microsoft as part of an ‘Ambassador Program’ for Microsoft. It was great to receive some on-site training from Brett Gilbertson from Tablet PC who was fantastic for tips, tricks and the best way to get the most out of the Surface Pro 4. Like with any new gadget, the first temptation was to press every button, touch the screens to find out all the hidden gems and ask lots of questions. When I was setting the Surface Pro 4 up, I thought about the accessibility options (how to use the device for people who are visually impaired, who have a hearing impairment and those with I.D such as Dyslexia). I will be writing a series of blog posts looking at how to access these features (because like with most things you only seem to access these when you REALLY need them and yes things like ‘Text to Speech’ can really help, even those in Business. At the moment, I am loving the ‘stylus’ for the Surface Pro 4. Having a stylus with other devices has been quite different, and I love how I can select shortcuts just based on certain preferences, like opening a new tool I have discovered called ‘Snip’ (there will be a blog post on this coming shortly). ‘Snip’ an ‘Office’ plugin, download from the Microsoft App Store. As a tip to ensure the stylus never goes missing, I clip my stylus to the bottom of my keyboard when it’s time to travel. Another thing I have discovered, is not having ‘lap burn’. I have always had to have a laptop stand before as I always ended up with red legs from having my laptop on my lap, so having the flat keyboard on my lap is much easier and less painful. 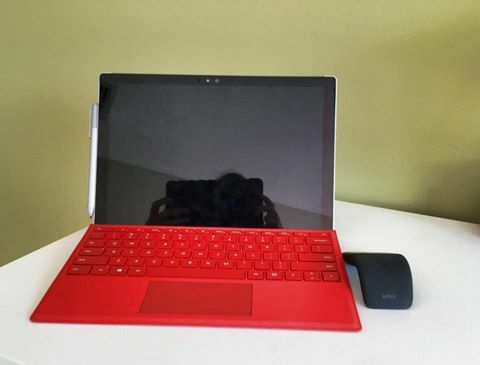 Since starting my business three years ago, some of my clients have switched to Surface Pro’s in various forms over this time. It has been interesting to see how they get around the devices and how they adapt (quickly or otherwise). For example, how to hold a pen in a certain way when drawing, but then touching the screen to change to ‘tablet’ format or even see which screens/apps you have open. I have found that learning these simple ‘gestures’ regardless of which device you use can really improve your ‘digital workflow’ when operating these devices. In fact, it can really speed up things (and I do enjoy watching people multi-tasking) whether this is productive for your brain, having a million things open at the one time is another blog post topic! I think personalisation is the key to successfully setting up the device. Like I mentioned before, I have changed the stylus settings already to shortcuts that are most helpful to me. It’s interesting to see the ‘digital workflow’ that I am already developing with using a new device. Like typing, then touching the screen to ‘scroll’ and then picking up the ‘stylus’ to activate another app. Even the fact, that I can reverse the keyboard so it’s facing down (and then de-activated) until I swing it back around to sitting on my lap. I find if all I want to do is write (like using OneNote) then I flip the keyboard around and can concentrate purely on the task of using the stylus. Like with any new technology, the trick is to follow a good healthy six week ‘digital program’. So, I am going to set myself the task of learning some new ‘tricks’ and shortcuts as well as more apps from the Windows Store over the next six weeks. It is all very well to learn these tips in isolation, but I find if I can think of a ‘case study’ or a situation where this might be helpful I try and use it in that manner.